Taking flight and taking off, as Yohji Yamamoto looked to aviators like Amelia Earhart and the Royal Air Force for different aeronautical riffs on core classic Y-3 silhouettes. Jackets were decorated with straps and buckles, and spliced with the signature adidas stripes. 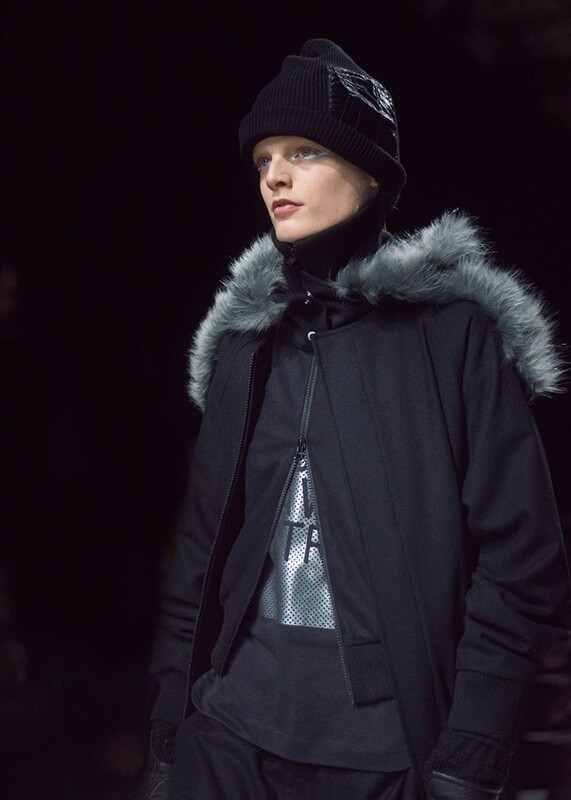 The Y-3 men were kitted up in new-wave camo jumpsuits, giant-pocketed combat trousers and reworked parka shapes to drum in the Royal Air Force connection, while the women who joined them on the runway wore cosy chevron striped knits, cropped wool jackets and full length sweeping skirts for a more feminine take on the aviator look. Black arrows and lines turned the runway into one fit for aircraft, and this flight course was amplified by a soundtrack from Jiro Animoto. Military influences have been scattered around Paris menswear. The camouflage print at Y-3 took the form of camo shapes – separated out and annunciated to create a more abstracted and modern take on the classic pattern. There was also a witty graphic slogan, based on imaginary air traffic control dialogue. The girls had ponytails which were slicked back and jutted out proudly. There was also a shimmer of silver liner around the eyes – a nod to the future as flight seeks to go into space.